The first families have moved into houses at Howe Barracks in Canterbury. Canterbury District Greens were out on Saturday, 2nd July, leafleting them with a message of welcome, useful phone numbers and a map of key locations in the local area. The Ministry of Defence gave up the lease on the properties last year and our own city council lost out in a bidding war with the London Borough of Redbridge to take them over. The far right group 'Angry White and Proud' protested at the barracks a few weeks ago and the families being moved here by Redbridge are likely to face further hostility. 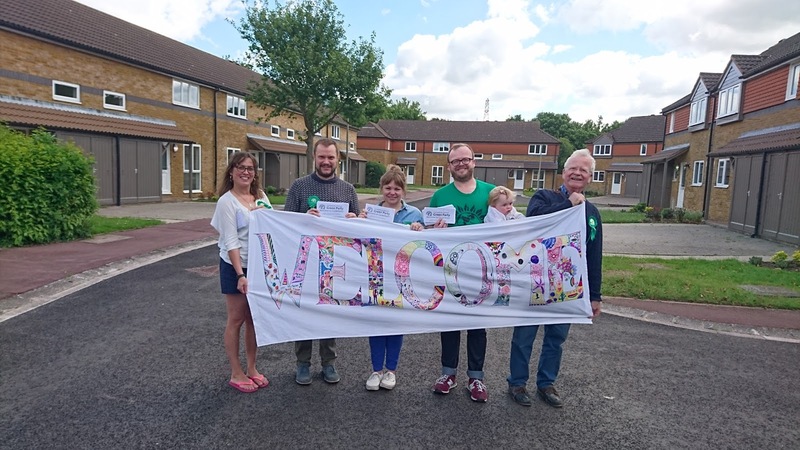 In light of this and the political climate at the moment, Canterbury District Green Party wanted to show that, while we would have preferred the housing to go to local residents who needed it, these families are very welcome to our community. Many of them have been victimised and forced out of their homes elsewhere. They should not be blamed for the disastrous housing policies of successive governments.